The magpie goose (Anseranas semipalmata) is a waterbird species found in coastal northern Australia and savannah in southern New Guinea. It is a unique member of the order Anseriformes, and arranged in a family and genus distinct from all other living waterfowl. The magpie goose is a resident breeder in northern Australia and in southern New Guinea. The species was once also widespread in southern Australia, but disappeared from there largely due to the drainage of the wetlands where the birds once bred. Magpie geese are unmistakable birds with their black and white plumage and yellowish legs. The feet are only partially webbed, and the magpie goose feeds on vegetable matter in the water, as well as on land. Males are larger than females. Unlike true geese, their moult is gradual, so no flightless period results. Their voice is a loud honking. This species is placed in the order Anseriformes, having the characteristic bill structure, but is considered to be distinct from the other species in this taxon. The related and extant families, Anhimidae (screamers) and Anatidae (ducks, geese, and swans), contain all the other taxa. The magpie goose is contained in the genus Anseranas and family Anseranatidae, which are monotypic now. 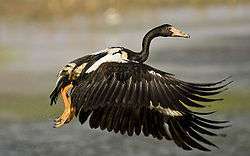 A cladistic study of the morphology of waterfowl found that the magpie goose was an early and distinctive offshoot, diverging after screamers and before all other ducks, geese, and swans. This family is quite old, a living fossil, having apparently diverged before the Cretaceous–Paleogene extinction event — the relative Vegavis iaai lived some 68-67 million years ago. The fossil record is limited, nonetheless. The enigmatic genus Anatalavis (Hornerstown Late Cretaceous or Early Paleocene of New Jersey, USA - London Clay Early Eocene of Walton-on-the-Naze, England) is sometimes considered to be the earliest known anseranatid. Other Paleogene birds sometimes considered magpie-geese are the genera Geranopsis from the Hordwell Formation Late Eocene to the Early Oligocene of England and Anserpica from the Late Oligocene of Billy-Créchy (France). The earliest known member of the group in Australia is an unnamed species represented by fossils found in the late Oligocene Carl Creek Limestone of Queensland. Additional fossils from North America and Europe suggest that the family was spread across the globe during the late Paleogene period. The Australian distribution of the living species ties in well with the presumed Gondwanan origin of Anseriformes, but Northern Hemisphere fossils are puzzling. Perhaps the magpie geese were one of the dominant groups of Paleogene waterfowl, only to become largely extinct later. This species is plentiful across its range, although this is significantly reduced in comparison to the range at time of European settlement. The range once extended as far south as the Coorong and the wetlands of the southeast of South Australia and Western Victoria. For Australia as a whole, it is not threatened and has a controlled hunting season when numbers are large. However, most of the southern populations were extirpated in the mid-20th century by overhunting and habitat destruction. The species has been subject to reintroduction projects such as Bool Lagoon between Penola and Naracoorte. Populations in more northern areas have again reached a level where it can be regularly utilized by hunters, although not in the example provided. In Victoria, the magpie goose was listed as near threatened on the 2007 advisory list of threatened vertebrate fauna in Victoria. In the December 2007 Flora and Fauna Guarantee Act list of threatened fauna, it is also listed. As of early 2008, an Action Statement for the recovery and future management of this species had not been prepared. ↑ BirdLife International (2012). "Anseranas semipalmata". IUCN Red List of Threatened Species. Version 2013.2. International Union for Conservation of Nature. Retrieved 26 November 2013. ↑ Livezey, Bradley C. (1986). "A phylogenetic analysis of recent anseriform genera using morphological characters" (Full text). Auk. 103 (4): 737–754. ↑ Hugueney, Marguerite; Berthet, Didier; Bodergat, Anne-Marie; Escuillié, François; Mourer-Chauviré, Cécile & Wattinne, Aurélia (2003). "La limite Oligocène-Miocène en Limagne: changements fauniques chez les mammifères, oiseaux et ostracodes des différents niveaux de Billy-Créchy (Allier, France)" [The Oligocene-Miocene boundary in Limagne: faunal changes in the mammals, birds and ostracods from the different levels of Billy-Créchy (Allier, France)]. Geobios. 36 (6): 719–731. doi:10.1016/j.geobios.2003.01.002. ↑ Worthy, T. H. & Scanlon, J. D. (2009). "An Oligo-Miocene Magpie Goose (Aves: Anseranatidae) from Riversleigh, Northwestern Queensland, Australia". Journal of Vertebrate Paleontology. 29 (1): 205–211. doi:10.1671/039.029.0103. ↑ The FFGA list does not distinguish different threat categories. Wikimedia Commons has media related to Anseranas semipalmata.